Full support & set-up! We ship it, you plug it in. Most parts in stock and can ship the same day. Custom built attachments to meet any need you have! Can’t find what you need? Contact us and we can talk about having it made special just for you. We will build the part, assemble your machince, and ship it to you. All you will need to do is plug it in! Every order from us is set up, tested, and shipped to you ready to use. When your box arrives all you need to do is unpack it and plug it in. No fuss, no assembly, just unpack and sew! See Our Machines in Action! Not sure if Jack is right for you? 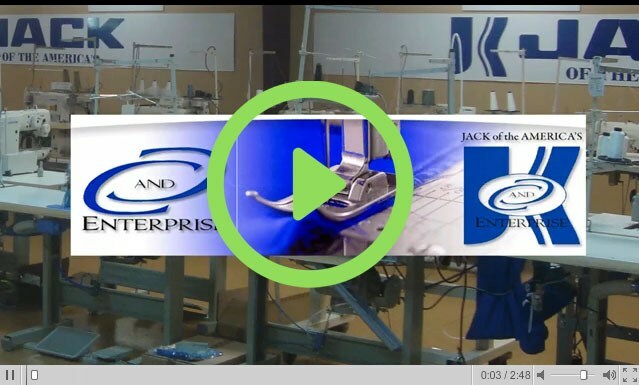 Here is a short video showing off some of our machines, give it a watch and see what Jack can do for you! You can’t afford down time and we feel your pain! At Jack Of The America’s, we have the industrial sewing machine parts you need and we’ll get it to you fast! Most parts ship the same day!